From the bestselling author of Nugget and Fang, a funny picture book for little ones about Goose, his buddies, and the silliest fishing trip. Goose and friends are off to the pond to fish. They have their rods, the perfect bait, and fishing gear—but when they cast their lines and GO FISH, there are NO FISH to be found! Maybe ONE FISH . . . but he’s awfully big! A mostly wordless picture book that will appeal to fans of Big Blue Truck, Llama Llama Red Pajama, and Where’s Spot?, Go Fish! will have little ones calling out words and giggling. The youngest readers will love the rhythm and tongue-twisting alliteration of the simple two-letter words go and no, as well as the sweetness of a friendship story with a classic feel. 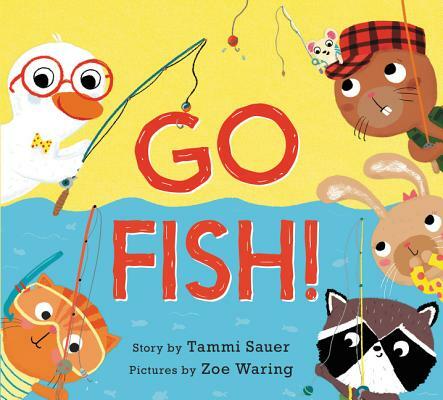 Tammi Sauer and Zoe Waring have created the perfect follow up to Truck, Truck, Goose!, which is also now available as a board book. Tammi Sauer is the author of such irresistible picture books as Making a Friend; Truck, Truck, Goose! ; I Love Cake! Starring Rabbit, Porcupine, and Moose; Your Alien; and Nugget & Fang. Tammi lives with her family in Oklahoma. You can follow her online at www.tammisauer.com and on Twitter @SauerTammi.